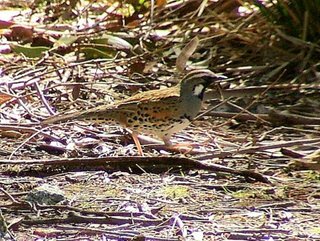 John & ShirleyTongue write : After Phil Robinson's post in August about the Quail-thrush at White-water Wall in Freycinet, we ventured up there today and happened upon one, lone, but very co-operative male. He fed nonchalantly along the track which crossed in front of us, for about 5 minutes or so. Sadly the limitations of our camera, the dappled light, and the constant movement of the bird means I don't have brilliant pictures. 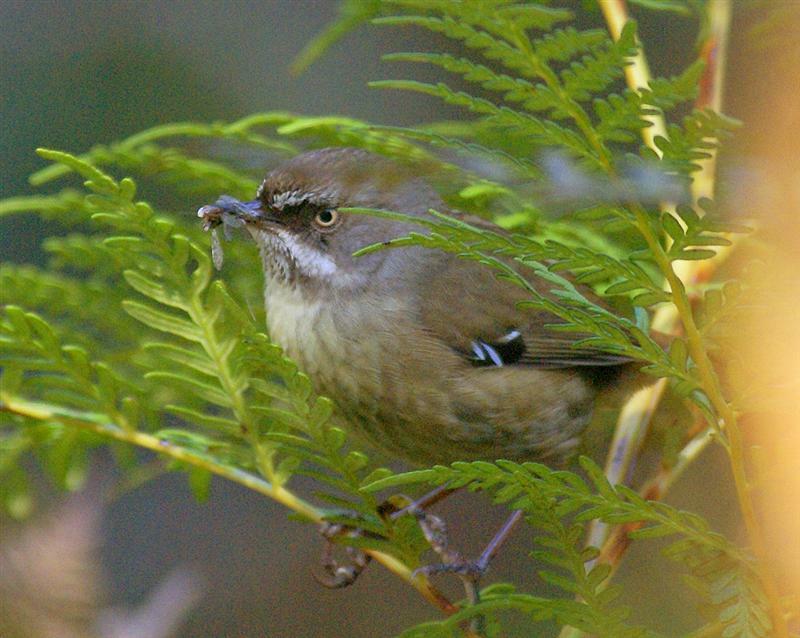 It would certainly be worth visiting for any Tassie birders looking for this species. [Ed: I've taken a lot worse with more sophisticated gear!--well done, John. Perhaps you could give directions for anyone interested]. I made a brief visit to the Wielangta Forest Reserve yesterday. As usual I stopped at the Southern end of the Sandspit Walk. As I walked back to my car, two Police vehicles arrived--didn't think I looked that threatening! But this is no laughing matter. Over the last weekend, I believe, one of the three huts provided for visitors, was burnt down, and the Police Forensics were investigating the remains. I have noted in recent weeks that several of the information signs have been vandalised too--burnt in fact, others defaced. I'm afraid that misuse and vandalism at many reserves, is all too common. Perhaps it was appropriate that the first birds I came upon at this site was a pair of Flame Robin (male pictured). This particular area is always worth a stop, it seems something of a crossroads, with birds usually associated with both wet and drier areas appearing together. Also present were a number of both Golden and Olive Whistler, Pink Robin, Scrubtit, Grey Fantail, Grey Shrike-thrush, Crescent Honeyeater, to name a few. Of special interest was a solitary Satin Flycatcher, the first I've seen this Spring, calling from high in the tree canopy. As birders we all have those days when an event takes place that we relive in our minds for many months after the event. A recent visit to a Southern beach saw one such event. While watching a distant flock of birds a shadow passed over me that instantly made me look up. On looking up I was startled for a few moments to see a White-breasted Sea Eagle not many metres above my head. 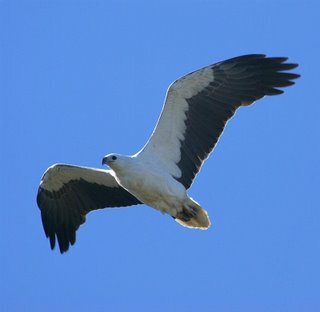 Although I was carrying a camera, it took a long time to bring it to bear on the Eagle. Too long! By the time I had got my wits together it had travelled on, and all I could see was its' rear end. Mixed emotions at this point. I had a very close view of the bird, but had failed to capture the moment. I needn't have despaired, it came back and gave me another chance! And then when it appeared to have decided I wasn't likely to cause any harm, it landed in a tree, some 100 metres away (top right). I had seen this or some other Sea Eagle in the area on many visits, often watching from a tree top. After a while it flew further into the lightly wooded area and I looked for it with my binos.. At this point my heart skipped a beat, as there wasn't one eagle, but two. And they were both standing atop a large nest of sticks, some metre or more wide and a similar depth. What the nest may contain, of course I don't know and I believe eagles often have several nest sites they use in rotation, so I can't be sure it's active. But I did wonder why I hadn't noticed this large nest on one of the many trips I have made to the area. I'm not going to tell you where it is for obvious reasons, but hopefully, if they have chosen this site, they'll be successful. Probably greatly assisted by the gale force winds we've been experiencing in the last several days, many of the migrant waders have returned from their breeding grounds in the sub Arctic. 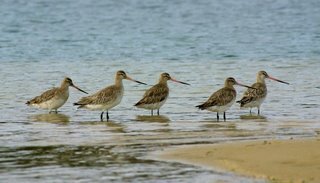 Most began arriving around the end of the week, and there are now, flocks of Red-necked Stint and Curlew Sandpipers in their favoured resorts around the Derwent Estuary. The accompanying shots were taken at Pipeclay Lagoon on a very wind swept Saturday morning. 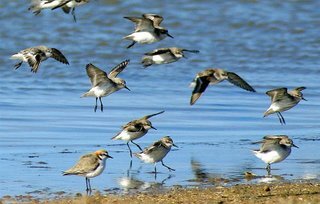 It was interesting to watch the flocks wheeling around at the slightest disturbance, but usually landing by some unsuspecting Red-capped Plover, presumably on the basis that if it was safe for them, it must be OK for us. The Redcaps were about in some numbers. On the small marsh near the oyster sheds, there were at least 12 pairs. Some, by their actions, appear to already have young runners , although I didn't see any. The shots show (top) Red-nacked Stints landing alongside a Red-capped Plover. 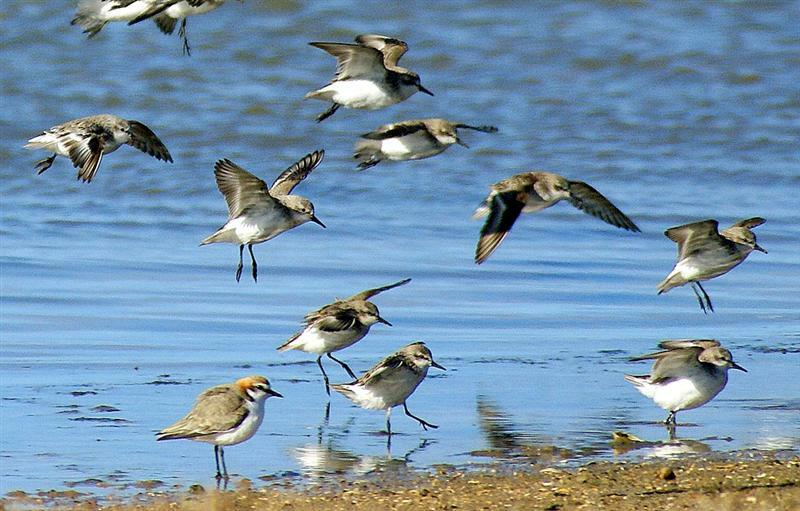 (Centre) part of a flock of around 250 Red-necked Stint, with 2 Curlew Sandpipers, of about 20 present, (see if you can spot them). (Bottom) Red-necked Stint and a single Curlew Sandpiper, landing back on the beach. I hesitate to bring up the next subject, but is birding etiquette, in Tasmania, dead? I have been hassled by mini bikes, off road vehicles, dogs, and a whole range of other activities, but on Saturday, I was hassled by another birder. Attempting to photograph the waders you see here--a difficult proposition given that the birds were very nervous and flighty in the high winds-- when, in the distance I noticed an approaching birder, well known to each other--who will remain nameless. I as sumed that as this person was obviously aware of my presence, 'they' would stay well away, and observe the birds from a distance--'they' had a scope. But no! Having disturbed one group of waders, 'they' marched on, and disturbed those near me too. So much so that they disappeared from the area completely, leaving about a fifth of the flock. I was not impressed! I spoke very briefly to them. The conversation was short, but not impolite. I'm not sure what the motivation was. I believe 'they' were either counting or more likely looking for possible rarities. Having recently returned from the US were there were often numbers of birders about, I was pleased to see the courtesies they gave each other in similar situations. I would like to think that we might give each other similar courtesies. I've made several attempts to photograph Tasmanian Scrubwren, largely without success--well no shots that I'm going to show you! They inhabit some of the darkest (and wettest) parts of the forest that are a challenge to photographers. I recently tried yet again in the Meehan Range. The attempt wasn't without some drama. After locating some Scrubwrens at the bottom of a steep gully, I lost a piece of camera gear into the gully. Sitting down to divest myself of binoculars etc.,before clambering down, I was bitten on the ankle by an Inchman. For those who may not be familiar with this ant, it's, as the name implies, around an inch long and armed with pincers to match. Fortunately, their 'sting' rarely has any lasting impact, at least on me. I also found several more of these insects hanging onto my footwear--I've often wondered whether they're attracted by foot odour! After retrieving the piece of gear, I rather lost interest in photographing at this spot, and thought I'd failed again. 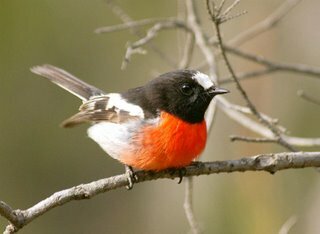 As I neared my car, I heard the soulful call of a Beautiful Firetail, and went in search of it. 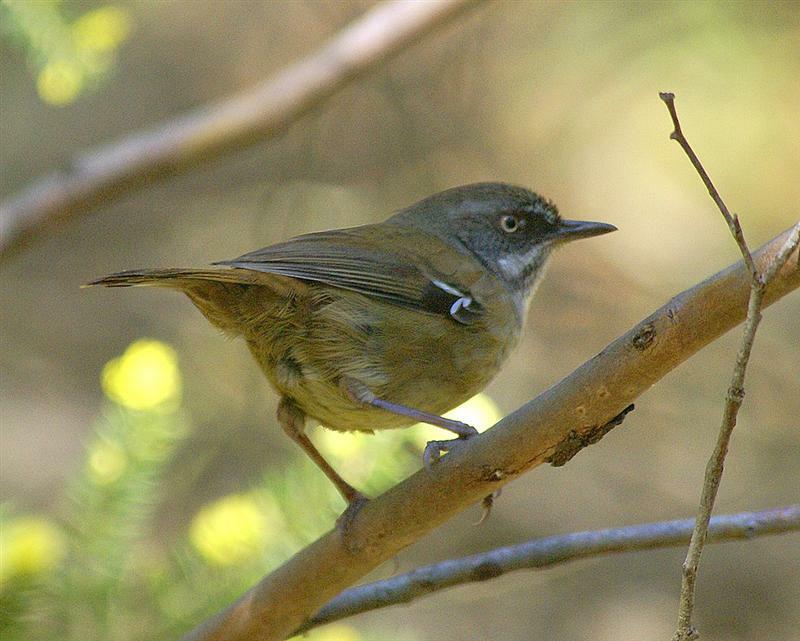 Almost immediately I was scolded by a Scrubwren from an area th at looked a possibility for photography. Firetail forgotten, I spent the next half hour or so taking the shots shown here. At first I was surprised that the Scrubwrens didn't just dive for cover, as they usually do. But after reviewing one of the images, I realised that they had a nest in the vicinity and were carrying food to their young. Time to withdraw and leave them in peace. The nest was in the centre of a lone clump of sags, in the middle of the, at present, dry creek bed. Domed and lined, it appeared to have 3 young, lightly covered in down. 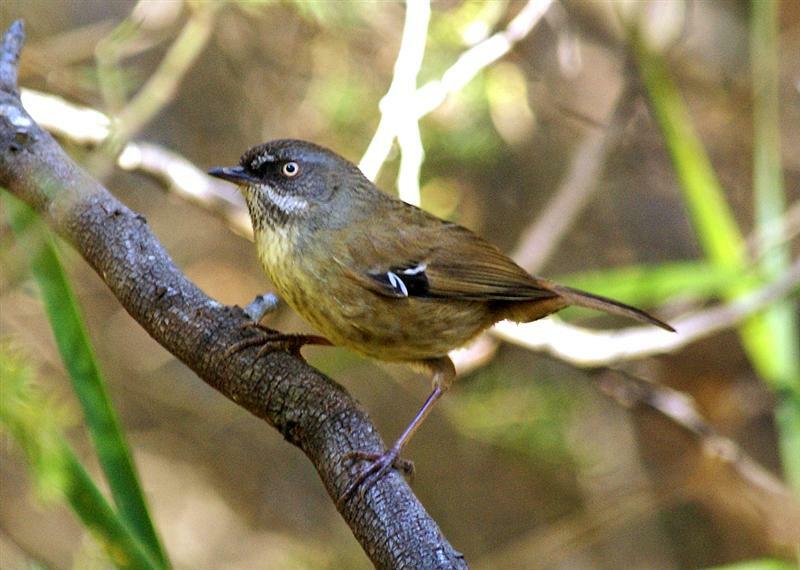 I have found several Scrubwren nests, over the years, but this was the least camouflaged of any I've seen. This species is a Tasmanian endemic, but was previously 'lumped' with the Mainland White-browed Scrubwren, albeit, as a sub species. 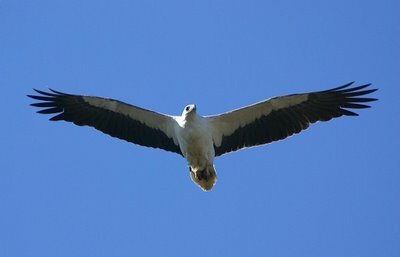 As I mentioned in the last post, I was 'chasing' a probably 'pair' of Pallid Cuckoos in the Meehan Range, when I was side tracked with the sighting of a 'White Goshawk', so here are the shots. No doubt during the course of the Summer, I will take many more. 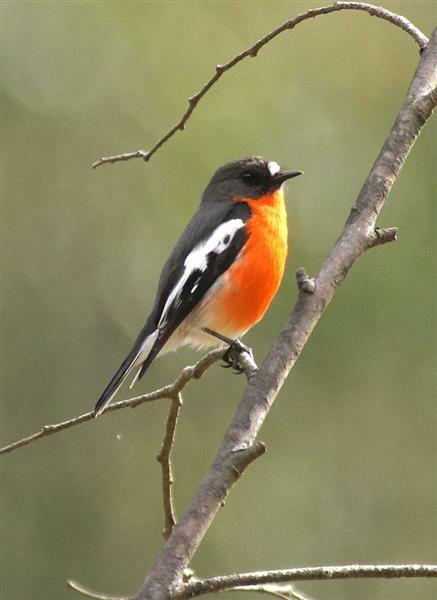 I have been noting the 'first arrivals' as they are posted on the 'birding-aus' forum. 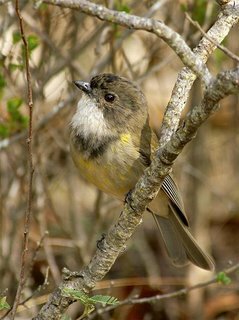 From those posts, one might conclude that the migrants seem to travel down to Tasmania at some speed, as first records from some Mainland sites, co-incided with my first record from here. To me, having pursued much of my early birding in the UK, the Pallid is the epitome of a cuckoo, looking more like its' European counterpart than any other cuckoo seen in this state. 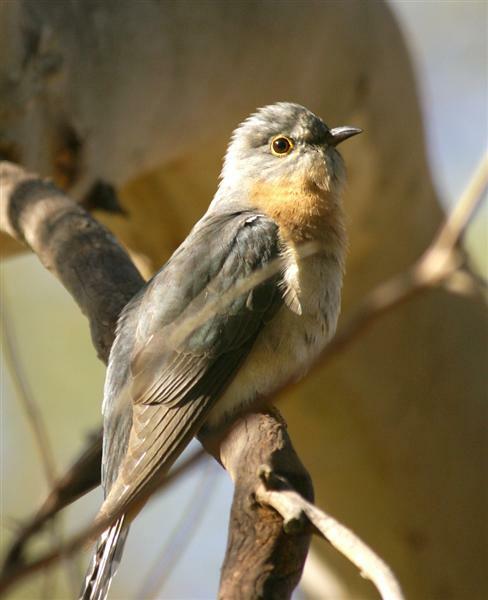 According to the literature, the Pallid parasitizes, ho neyeaters, woodswallows, whistlers and flycatchers, so it should find the Meehan Range to its' liking, as they're all found here in some abundance. 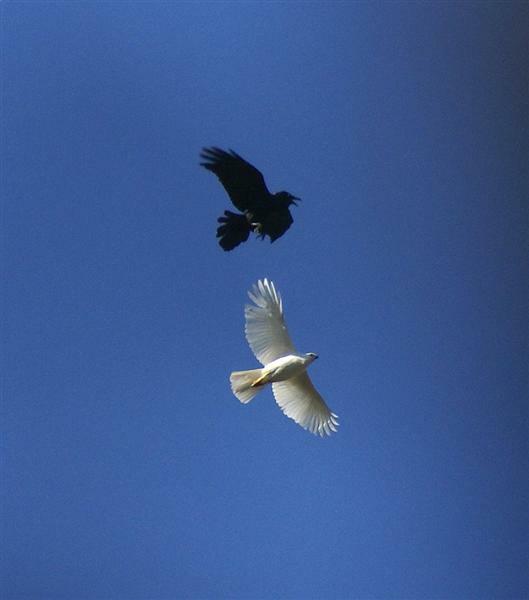 The two birds pictured, spent much of their time high in the tree canopy or at the top of dead limbs. Every time they flew rapidly through the light timber, they were pursued, mainly by honeyeaters. 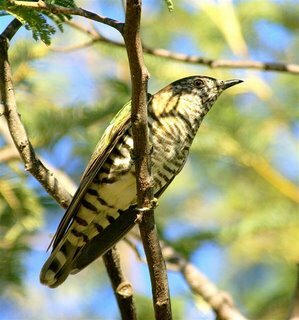 My first thoughts were that perhaps the honeyeaters knew they were potential hosts to these cuckoos. But I think more likely, the cuckoos look very much like small hawks in flight, and for that reason alone, needed to be seen off. 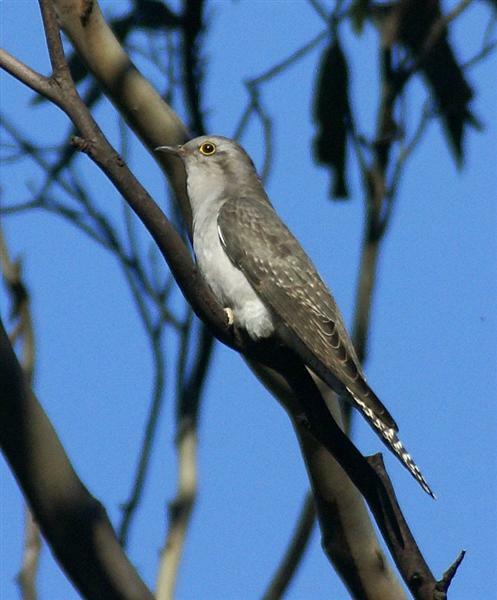 From my observations over the years, the Pallid Cuckoo adults seem to be the first of the cuckoos to leave Tasmania, often as early as February. Enjoy them while they're here. You may feel you don't want to hear about the first part of this morning's saga, but I was bitten by a dog!! Not a life threatening bite, but more than a playful nip. I know dogs on leashes are one of my constant themes, and this morning's episode highlights what I'm on about. I entered the Meehan Range (a 'dogs on leashes only' area), and had not gone more than a 100 metres, when a group of 4 dogs in the charge of an elderly women, rushed at me. This is not the first time this has happened and I have remonstrated with the woman about leashes. I am not easily cowed by dogs, but one made a determined effort and finally bit me on the leg. You might have thought I would be in line for an apology, at least. Not on your life, the woman merely told me that I should be aware that she exercised her dogs at this time every morning and kept out!!! In a public reserve!!! And you perhaps have wondered why I go on about dog owners. On to the bright side. I heard my first Pallid Cuckoos this morning, calling from near the crest of a nearby hill and set off in pursuit. 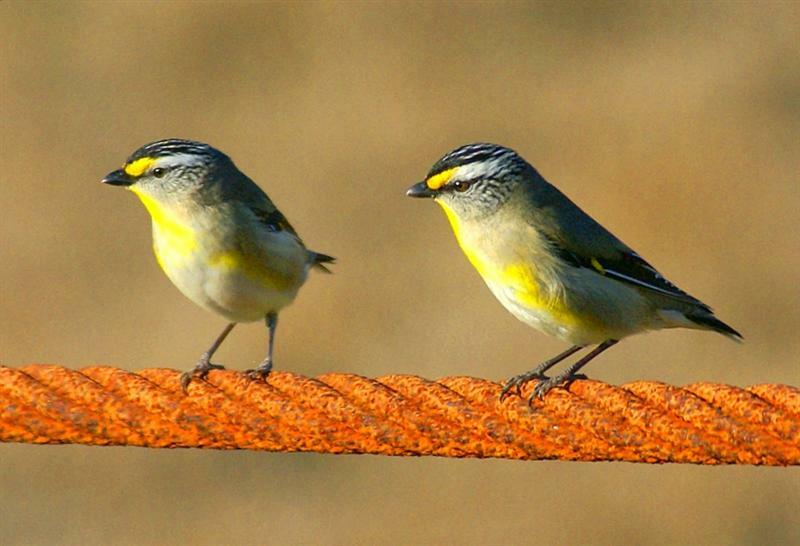 I eventually came across two birds, probably a pair by their behaviour. They were quite difficult to photograph, as they chose to keep to the tops of the trees, but I managed to get a few shots. It was while I was photographing them that I noticed a white bird being pursued by a Forest Raven. I assumed it was a gull, many fly over the Meehan Range, but wondered why it would interest a raven. Then the penny dropped! 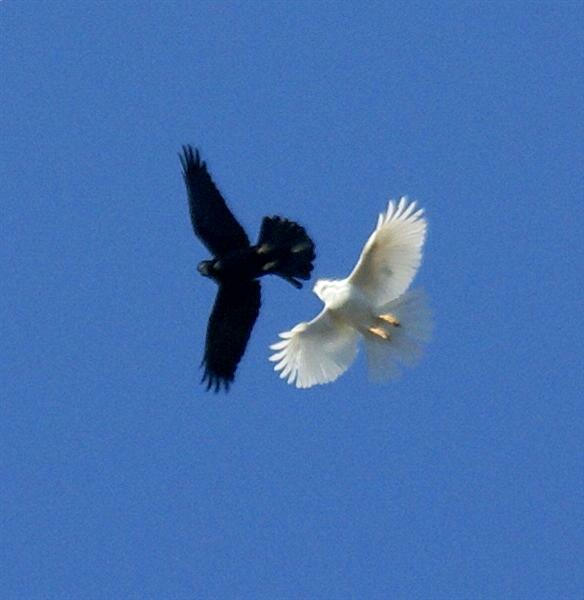 The white bird was a white morph Grey Goshawk. I took several photos, some reproduced here. This is the first time I have seen this species in this reserve, and I have been coming here for around 30 years. Other people have mentioned seeing them further North in the range on the Richmond side of the hills, although I was a bit sceptic al. There are fair numbers of Sulphur-crested Cockatoos here too. 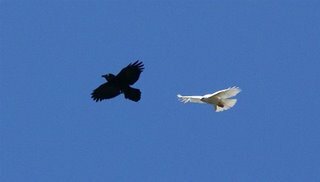 The goshawk seemed mainly unfazed by the raven, and only once attempted to turn on it's back to retaliate with it's talons. Both birds were circling in the thermal and probably about 200 metres up when I first spotted them, so the quality has suffered. I hope you can share some of the excitement of this event. A very memorable morning! 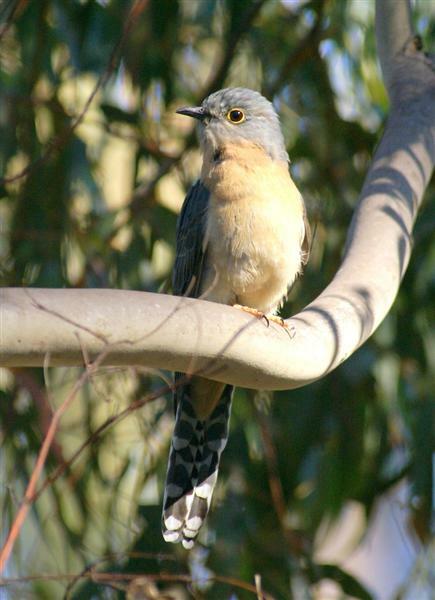 Robins are normally host to bronze cuckoos (but that may occassionally happen). I suspect that they saw the cuckoos as competitors for the locally available food supply. Either way, for me it was an unexpected bonus, and for an hour or so, was able to forget my ailments! 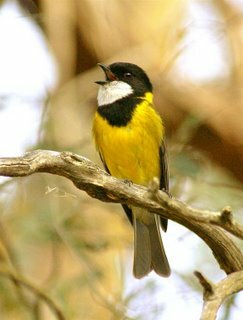 A beautiful Monday morning in the Peter Murrell Reserve at Kingston revealed a number of Fan-tailed Cuckoos calling repeatedly. They even managed to outdo the Golden Whistlers. I was struck by the numbers of them in this reserve, presumably only recently arrived from the Mainland, although a few do overwinter. 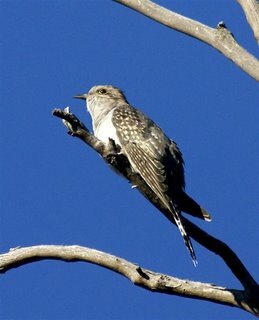 Although the long trill is the call most associated with this cuckoo, they do in fact have quite a r ange of calls. I watched as the birds pictured, called, and noted that their whole body quivered as they delivered it, something I hadn't noticed before. Also newly arrived were a few Horsfield's Bronze Cuckoos and a small flock of Swift Parrots. I spent much of an absolutely gorgeous Monday morning in the Peter Murrell Reserve at Kingston. 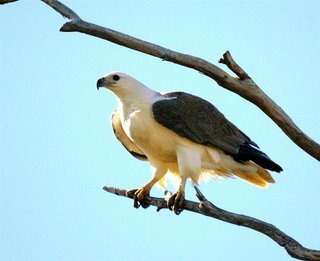 The reserve was very much alive with bird activity, and two of the more obvious denizens, were the Swamp Harrier and the Brown Falcon. The harrier spent much of its' time, soaring and calling, announcing to others that this territory was occupied. 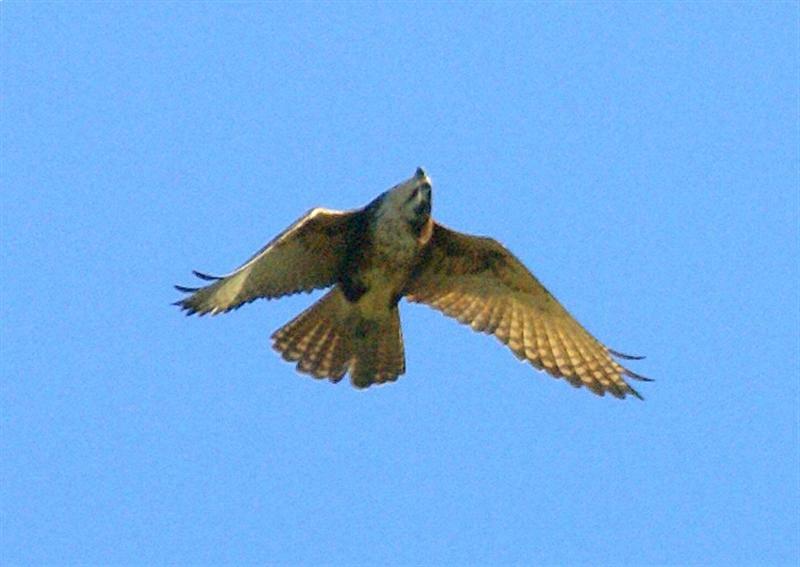 At the tree top level, the Brown Falcon, was noisily calling and performing fast fly pasts. As I walked back to the car park, I noticed the harrier hovering over the forest canopy, but I suspect that my appearance caused it to climb higher and start to spiral over the open ground. 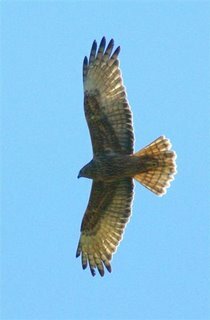 The 'brown' must have noticed this too, and followed suit, albeit at about 15 metres lower, mirroring the harrier as they both clim bed higher. Although I was some distance away, I took the accompanying shots. As I was processing the images, I noticed that the 'brown' had its' head fully inverted (I assure you that I haven't manipulated the image!). Well I suppose that's one way of keeping an eye on a potential competitor! 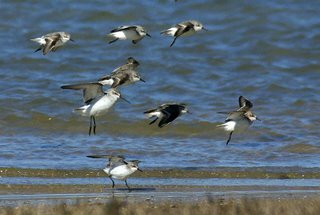 I paid an early morning visit to the Marion Bay Spit on Friday morning, largely in the hope of seeing some newly arrived migrant waders. A typically cool, if not cold, Spring morning greeted me. Fortunately there was only a light Sou'westerly wind blowing, as I plodded along the Blackman Bay side of the spit. I noted the few pairs of Pied Oystercatchers that seem to have taken up territory, a group of around 30 Pelicans, roosting on a distant point and a constant stream of Black-faced Cormorant, to and from the navigation towers. Nearing the spit end, I came across about a dozen pairs of adult Pacific Gulls in a loose, roosting flock, but not a Kelp Gull to be seen. I wondered whether the kelpies had stolen a march on the 'P.Gs', by occupying the prime sites at the breeding grounds on nearby Visscher Island. 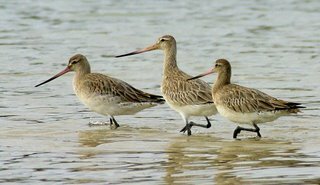 On the shore of the entrance to the bay, was a flock of five Bar-tailed Godwit, feeding on the rising tide, none showing any real sig ns of breeding plumage. Were these newly arived or had they overwintered? At least they allowed fairly close approach for the shots at top and bottom. Further on were a group of Crested Terns, but on scanning the bay, I could see many more, probably 200+, roosting on the oyster racks. Some of these birds were engaged in nuptial chases and others were carrying small fish, no doubt to strengthen the pair bonds. Further on still, was a group of 3 Sooty Oystercatchers, all non breeding youngsters. But my expectation of seeing other migrants were dashed. I wandered back along the ocean beach side, noting about 5 pairs of 'territorial' Pied Oystercatchers. 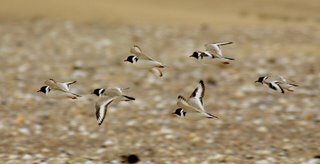 I had just about given up on seeing any other waders, when, out of the corner of my eye, I caught sight of 6 Hooded Plover. If they hadn't moved, I wouldn't have noticed them, hard up against the dune. They are very cryptically marked, as can be seen in the photo of them in flight. Not much in the way of migrant waders today, but they should be here very soon. "The hills are alive with the sound of....Golden Whistlers". Well that about sums up my morning in the Meehan Range at Cambridge. Although I say "in", in fact I barely moved more than about 100 metres from the entrance. As I got out of the car, one of the more obvious bird calls were from a number of Golden Whistlers calling loudly. Despite a number of attempts to photograph them in the past, I hadn't managed a decent shot, so I set about trying to rectify that. Most of my birding over the years has rarely included sitting in one position and waiting, and I'm beginning to realise what I may have missed. As I waited for these whistlers to approach, I watched them feeding. Mostly they sat among the acacia (a.dealbata, which is in flower), peering upwards, before flying up and grabbing, what mainly appeared to be small caterpillars, secreted on the underside of the leaves. The calling birds, would still forage as they moved from one vantage point to another, to proclaim ownership of its' territory. Interestingly, the birds pictured at top and bottom appeared to be a pair, but as you can see the 'brown' bird actively called as well as the male (the apparent blue markings are in fact a shadow!). So does that suggest that both sexes call, or am I just mistaken in believing they're a pair. The male certainly tolerated the 'brown' birds presence. 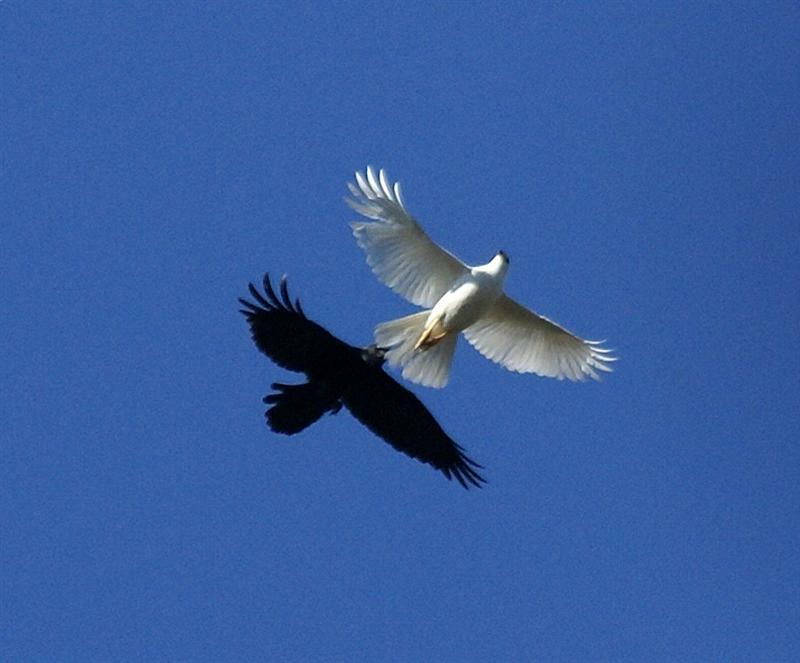 Another possibility is that the male tolerates the 'brown' birds presence because it isn't in 'full' breeding plumage. As you can see, the bird pictured at centre right, is in transitional plumage, and presumably will soon moult into full male colours, although I assume that will happen after breeding. From the above, you can see that I ended the morning with more questions than answers! But it was fascinating watching them going about their business. 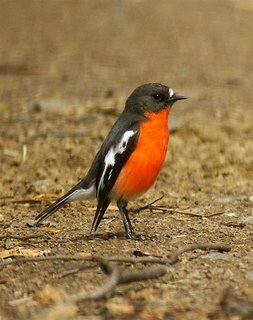 I also had a bonus in managing to get shots of Scarlet Robin, Brown Thornbill, Black-headed Honeyeater and Grey Shrike-Thrush while waiting. They will have to wait for a future blog. On Tuesday morning, with a less than promising forecast, I decided on a trip to Gould's Lagoon at Granton. My main aim was to see whether the Reed Warblers (I should , of course, call them Clamorous Reed Warbler), were about yet. These warblers are mainly Summer migrants to Tasmania. 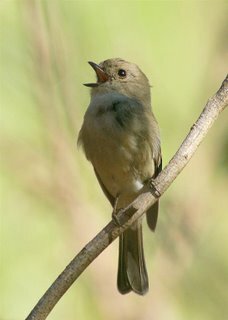 I say mainly, because in some years I have heard them calling, usually on still sunny days in June, in the reedbeds of the Tamar River. I arrived to see the railings on the walkway to the public hide, 'covered' in Chestnut Teal and Black Duck, all reluctant to move as I accessed the hide. From the hide I recorded many of the usual inhabitants, including Blue-winged Shovellers, Coot, Little Pied , Little Black and Great Cormorants, a few Kelp Gulls, a Great Egret, and several Purple Swamphen. As I wandered back to the car park, I scanned (and listened) over the reed beds for warblers, none. But I could hear the plaintive call of several Little Grassbirds. I stood patiently on the walkway, hoping that I might glimpse one, my vigil broken by a well meaning local, who deposited 2 loaves of sliced bread in the lagoon almost in front of where I was standing. This caused some mayhem among the ducks and feral geese! I wasn't impressed, but he did ask me whether I wanted some bread to feed to the ducks. I declined, and was about to suggest that it probably wasn't the best diet for the wildfowl, but decided against it. Well it was wholemeal bread!! But back to the story. 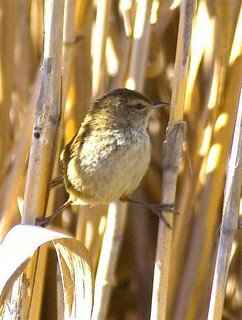 I had glimpses of several Little Grassbirds as they dashed between clumps of reeds, and I could see reeds moving as they scavenged amongst them. Just as I was about to give up, one took pity on me and stopped just long enough for me to take the single photograph above. Hardly a definitive photograph of a grassbird, but better than nothing. 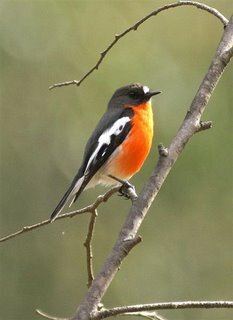 Just as I neared the car park, a solitary Swift Parrot flew out of the Blue Gums, only my second sighting this Spring. If Little Grassbirds have eluded you so far, you could do worse than pay a visit to Gould's. I suggest you listen to a recording of their call before you go, it will greatly help finding them, and be patient! No, it's not the call of a nagging houseperson (have to be politically correct these days) ! 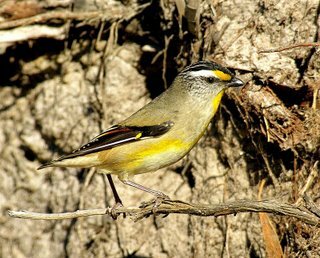 It's the equally nagging call of the Striated Pardalote at this time of year, as they carve out their territory. This pardalote nests in holes, in the ground, on banks, in trees, in pipes and anywhere similar that takes their fancy. 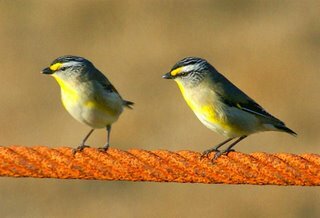 They're marginally bigger, certainly heavier, than the other 2 pardalote species seen in Tasmania, the Spotted Pardalote, and the Tasmanian endemic, Fortyspotted Pardalote. I also watched one of the pairs I photographed, drive off an interloping 'spotted'. As both species nest in similar habitats, I suspect that they are often in conflict over breeding sites. I wonder what impact they have on the rare, 40spotted? The Striateds are easy to approach, and quickly adapt to the close proximity of humans. It's surprising, therefore, that this is the first time I've photographed them, although, unlike the other 2 species, the Striated is a migrant, having arrived back in the state in the last few weeks. 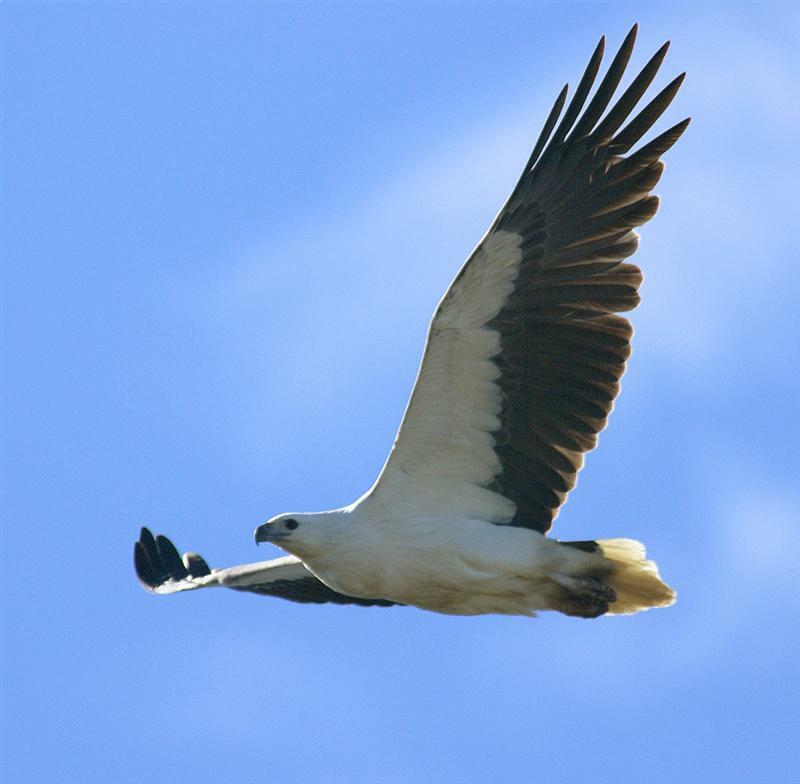 The accompanying shots were taken at Cape Deslacs Reserve at Pipeclay Lagoon, where their territorial calls would suggest that there are many pairs about to breed. 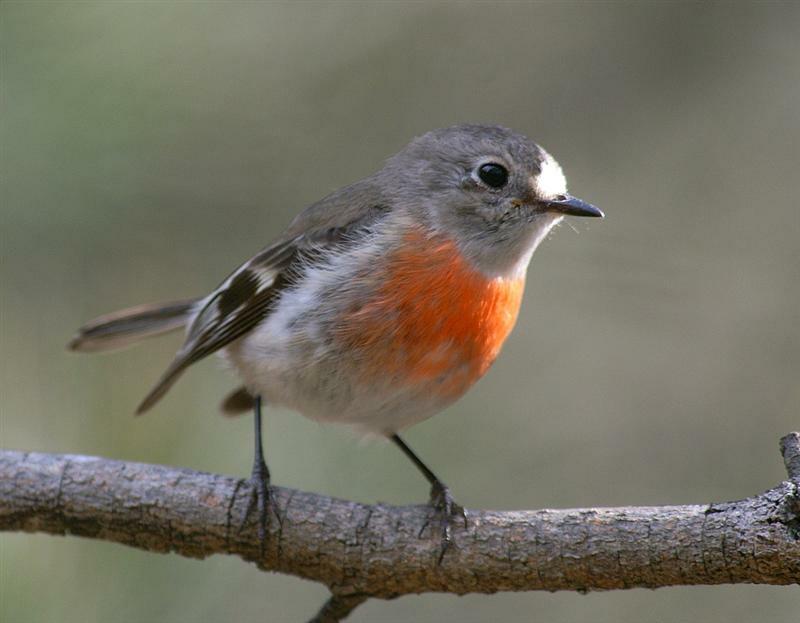 John & Shirley Tongue write: We've managed to add Turkey, Pheasant and even Peafowl to our Tasmanian Bird list, especially on King Island, where they all run wild. 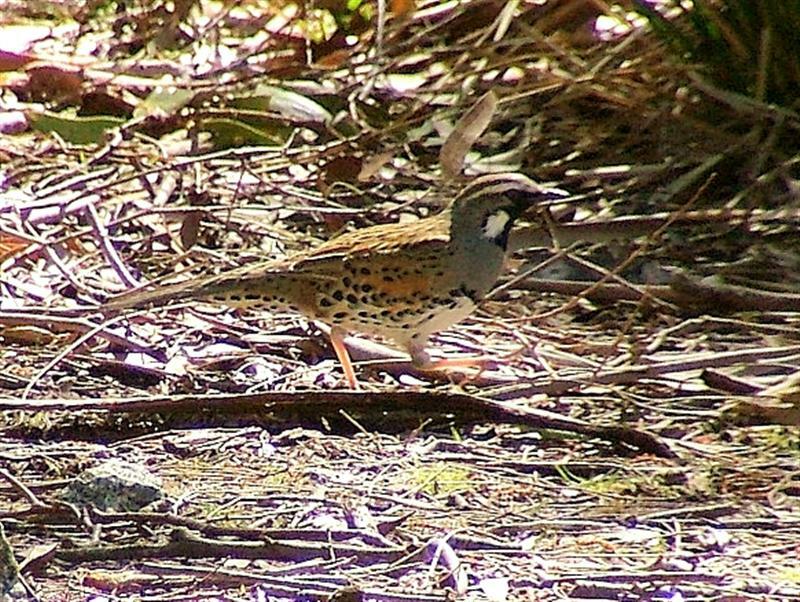 However, we've also seen wild-run Peacocks on Mainland Tassie, and heard of Pheasant here in places, too. In lots of places we've seen geese, but NOT counted them, because they were so close to farm houses that they were obviously 'domestic'. Likewise with domestic chickens. But when does 'Domestic' become truly 'Feral'? 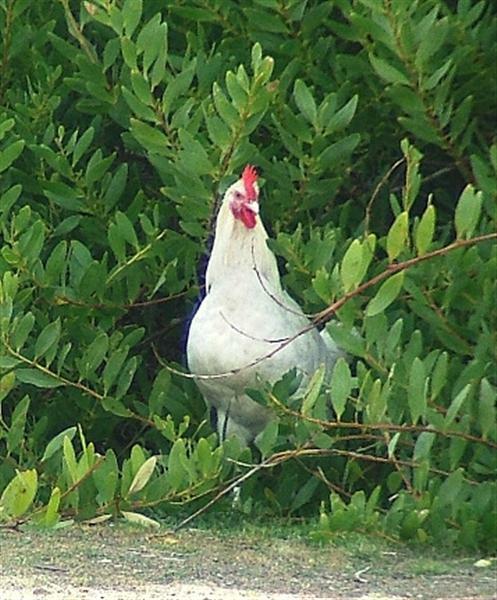 We have seen truly feral chickens on Flinders Island, and so t oo, we think, today (Thursday). On a very productive day out birding--which has us planning to organise a Tasmanian 'Twitchathon', but more about that in future postings--we came across these two "chooks" apparently living wild. They were at the second last of the car parks for Calvert's Beach, South Arm. They were a long way from the nearest human habitation, and had taken up residence in the coastal wattle. They were pretty wary of human approach, but had figured out how to work the system, for as soon as people left their cars, they came roaming around looking for scraps to eat. 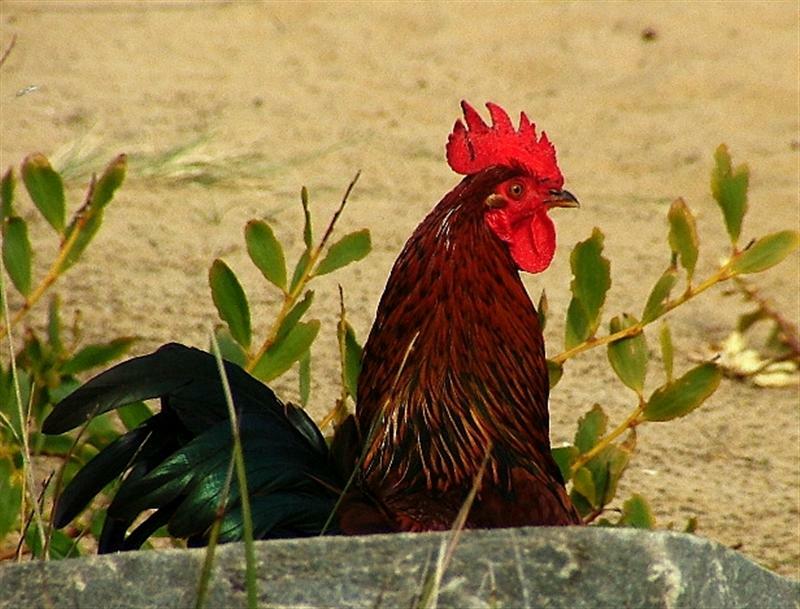 Initially, we thought that there was only the rooster, but then found the hen as well. Presumably, if they find enough water, and get enough scraps and other pickings, they could well nest in under the wattle, and then we'll have our own little population of "Feral Chooks".